Making the upgrade to 5.1 surround sound can be a pricey undertaking. There's lots to consider, from AV amps to whether or not you want to go the whole hog to a Dolby Atmos system. 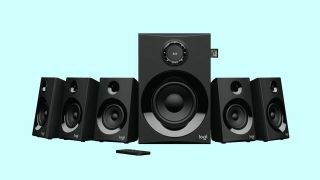 Logitech is looking to cater for those on a much tighter budget, without limiting the playback sources its latest speaker system can tap into. It's today announced the Logitech Z607 5.1 Surround System, available for the bargain price of £109.99. That translates to roughly $140 or AU$200 – a steal for getting that immersive sound around your home. So what do you get for that price? "True" 5.1 surround sound from five satellite speakers and a 5.25-inch subwoofer, for a 160 watts max output. You'll be able to connect up a TV, phone or computer via Bluetooth, 3.5mm or RCA cables – so note that this isn't going to offer any HDMI passthrough if you're looking to make this part of a living room cinema system. However, it's aiming to make set up and use as straightforward as possible, with 6.2 meter cabling letting you easily dot the speakers around your room, and USB, SD card and FM radio playback all supported. There's also a small remote control included for controlling playback across a room. Expect to find the speakers on sale from today over at the Logitech website.